I’m back with a glimpse into chapter three, Animals and the Alphabet. 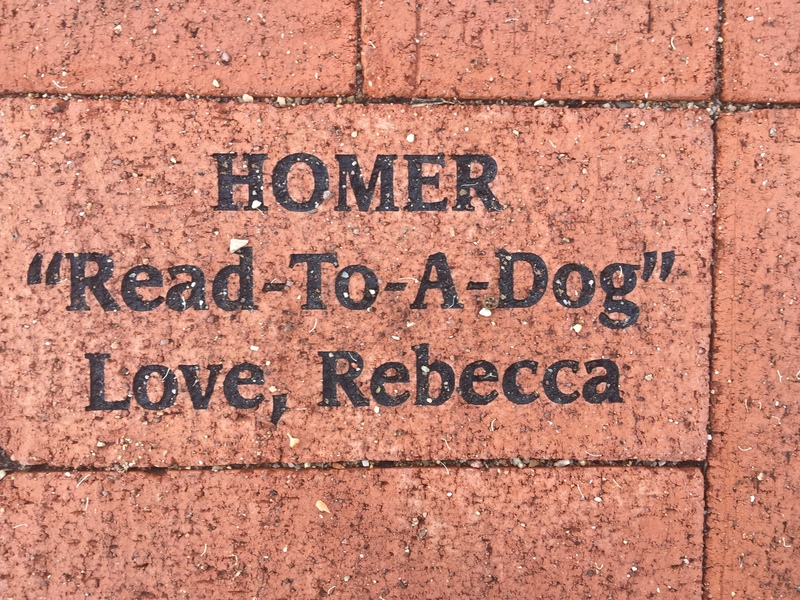 Yesterday on a early morning walk to one of my fav libraries in Tucson, Himmel Park Library, I was enjoying all of the clever sayings on the sidewalk of bricks, which are given as donations to help support the library. The picture of this brick is not in the book, but only because I just found it. Here is an image from Katie Knox, which will be in chapter three. Next, here is the visual of the contents of chapter three which Missy Urbaniak created for me. And, finally, here is the opening story of chapter three. Education is radically about love. Recently, I was sadden and thrilled when a precious little neighbor girl was sobbing because the puppy died in a story, which her mom was reading to her. “Please read it again, Mommie,” she sobbed to her mom. I was saddened, as the little girl could not stop the tears from running down her face, and I was simultaneously thrilled, as she wanted to hear the story again and again. This reminded me so much of when I used to read Where The Red Fern Grows, by Wilson Rawls to The Benson Kids, when they were 8th graders. We lived on the desert, and the students, who always seemed to be hot, sweaty, and dirty, came running into the classroom after their lunch. I now know that reading stories to anyone of any age, hot or cool—dirty or clean—has untold cognitive, affective, and social benefits. Year after year, the students always wanted to hear Where The Red Fern Grows, and it always left us with a few tears and many poignant memories. “Lil Ann died peacefully yesterday,” Darcie said to me when I arrived to visit her after an absence of decades. When she greeted me with those words, we both immediately knew the literary reference, although years had passed since I read Where the Red Fern Grows to Darcie and her fellow 8th grade classmates. Simultaneously and instantaneously, Darcie and I were carried back to the final scene in the book, when “Old Dan,” the trusted hunting dog, died after saving Billy from a mountain lion attack. In the story, “Lil Ann,” the female hunting dog, died within a few days of a broken heart. Darcie reminded me that this fictional scene was so sad for me, that I was not able to continue reading aloud to the class. Fortunately, another 8th grade student jumped up from his desk to read the final pages of the novel to his classmates, Darcie, and me. Tears and silence prevailed, as none of us wanted to re-enter reality. And, now here I was reconnecting with this former student, the day after her own beloved “Lil Ann” had died. To my copy-editor friends, who are reading this, yes, this example is taken from my pre-copy-edit-version, as the post-copy-edit-version just had too many mark ups on it.